ASP.NET Core Middleware concept is one of powerful features introduced, it gives us complete control over HTTP pipeline using Request and response.They effectively replace for HttpModules and HttpHandlers. ASP.NET docs explain middleware concept quite well, have look at it. ASP.NET Core Middleware examples are UseMVC, UseStaticFiles, UseIdentity etc. They have specific purpose to do, thats why we might end with many of them. In this article, we will create custom middleware to be used in ASP.NET Core Web API. Lets understand the scenario for writing this custom middleware. Public APIs like Twitter, Google, Facebook etc provide us some sort of application key; naming them as “app-key”, “user-key”, “api-key” and so on. Similar to above examples, we might have created Web API which provides a key to those who are registered. Whenever a request hits our Web API, then we check if Request Headers contain this key or not then we move ahead to process the request positively or negatively. We will write custom middleware that checks request header and takes required action. My scenario is “A user registers in our system to generate a “user-key“; using this key all requests are sent. The Web API project will check if “user-key” exists or not in header. If exists move ahead to validate if key is part of our registered user, if not then respond back with 401 status code. If key not present in Header then it will be Bad Request. Create “Middleware“ folder in ContactsAPI project, then create C# class “UserKeyValidatorsMiddleware“. RequestDelegate helps us invoking next component in pipeline. IContactsRepository is DI to help us validate “user-key” against data source using method “CheckValidUserKey“. In the Invoke method, we check if Request Header has “user-key” or not, if NO then return with Bad Request. If exists then check with against database if it exists or not. If NO then you are not Authorized is returned. Now lets update IContactsRepository to validate the user key Open IContactsRepository.cs and ContactsRepository.cs; add below code. Now that we have created custom ASP.NET Core Middleware, added repository using DI and added it to pipeline. Let’s see it working. 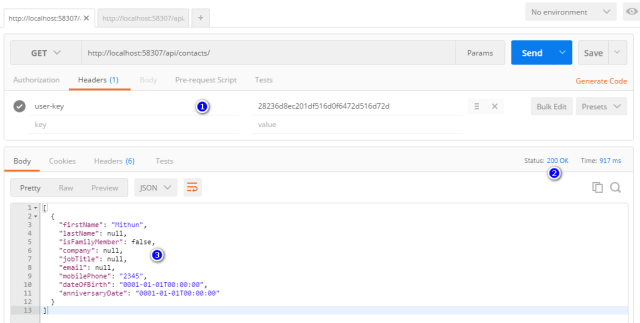 Use POSTMAN to test this Web API Test 1: user-key doesn’t exists in Request Header. Test 3: user-key exists, its VALID and return JSON response also. Refer ContactsAPI repo on Github for full source code. Let me know your thoughts on this.